This system occurs in central, north-central and eastern Montana and as a minor occurrence in southwestern Montana. Elsewhere, it occurs throughout the western U.S. including the Intermountain Basin states, the Columbia Plateau, the Rocky Mountains and the western Great Plains. It is found on nearly level, older alluvial terraces on broad or narrow floodplains and coalescing alluvial fans in valleys. It may also occur on broad expanses along lake shores and playas. Sites typically have saline soil and a shallow water table. They flood intermittently, but the surface is dry for most of the growing season. The water table remains high enough to maintain vegetation, despite salt accumulations. Sites occur where overland flow or soils or a combination of both allow for greater than normal moisture regime. In many cases, fine textured soils result in a perched water table. The structure of this system usually consists of open to moderately dense shrubs dominated by greasewood (Sarcobatus vermiculatus) with a sparse graminoid understory most commonly consisting of western wheatgrass (Pascopyrum smithii). This system occurs throughout the western U.S. including the Intermountain Basin states, the Columbia Plateau, the Rocky Mountains and the western Great Plains. 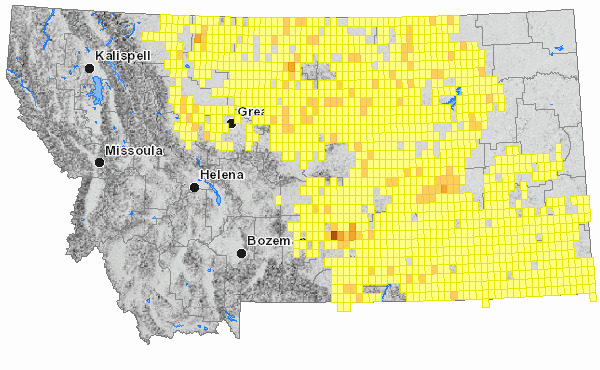 It occurs in central, north-central and eastern Montana and as a minor occurrence in southwestern Montana. Approximately 1,187 square kilometers are classified as Greasewood Flat in the 2017 Montana Land Cover layers. Grid on map is based on USGS 7.5 minute quadrangle map boundaries. In Montana, this ecological system represents one of the driest extremes of the riparian/wetland zone. It occurs on nearly level, older alluvial terraces on broad or narrow floodplains and coalescing alluvial fans in valleys. It may also occur on broad expanses along lake shores and playas. Sites typically have saline or alkaline soils and a shallow water table. They flood intermittently, but remain dry for most of the growing season. However, the underlying water table stays high enough to maintain vegetation, despite salt accumulations. The system occurs where overland flow or soils or a combination of both allow for a greater than normal moisture regime. High water tables are common, typically within 25 to 30 centimeters (10 to 12 inches) of the soil surface. Soils are fine textured, poorly drained and are alkaline or saline. Soil texture ranges from silt to clay. Sites range in elevation from 655 to 1,067 meters (2,150 to 3,500 feet) (Hansen et al., 1995). Greasewood (Sarcobatus vermiculatus) is the dominant shrub, although overall canopy cover may be low. Other shrubs present in some occurrences include four-wing saltbush (Atriplex canescens), shadscale saltbush (Atriplex confertifolia), Gardner’s saltbush (Atriplex gardneri), Wyoming big sagebrush (Artemisia tridentata ssp. wyomingensis), big sagebrush (Artemisia tridentata ssp. tridentata), silver sage (Artemisia cana ssp. cana), green rabbitbrush (Chrysothamnus viscidiflorus), rubber rabbitbrush (Ericameria nauseosa) or winterfat (Krascheninnikovia lanata). Perennial grasses are the most common herbaceous cover, with western wheatgrass (Pascopyrum smithii) tending to dominate in undisturbed communities. Other graminoids commonly occurring in this system include slender wheatgrass (Elymus trachycaulus), prairie cordgrass (Spartina pectinata), Nutall’s alkaligrass (Puccinellia nuttalliana), Sandberg’s bluegrass (Poa secunda), inland saltgrass (Distichlis spicata), alkali sacaton (Sporobolus airoides), prairie sandgrass (Calamovilfa longifolia), basin wildrye (Leymus cinereus) and occasionally common spikerush (Eleocharis palustris). Common forb species include yarrow (Achillea millefolium), one-flowered groundsel (Pyrrocoma uniflora), boreal sagewort (Artemisia frigida), western sagewort (Artemisia ludoviciana), goosefoot (Chenopodium species), scarlet globe mallow (Sphaeralcea coccinea), western saltwort (Salicornia rubra) and curlycup gumweed (Grindelia squarrosa). Adjacent drier communities are dominated by upland shrub or grassland communities such as mixed salt desert scrub, big sagebrush (Artemisia tridentata) shrublands, or three tip sagebrush (Artemisia tripartita) shrublands. Wetter adjacent communities may be dominated by inland salt grass (Distichlis spicata) or willow-cottonwood (Salix-Populus species) dominated communities. In Montana, this system can occur near alkaline lakes or in overflow washes. Soil-water dynamics within this system support a restricted range of species. Communities in good condition typically have 30 to 40 % shrub cover. Under continued disturbance, greasewood and western wheatgrass decrease in cover, while species such as foxtail barley (Hordeum jubatum) and yarrow (Achillea millefolium), and exotics like cheatgrass (Bromus tectorum), Japanese brome (Bromus japonicus) and Kentucky bluegrass (Poa pratensis), increase in cover. Overgrazing practices can significantly impact vigor and cover of principal shrub species, leading to an increase in cheatgrass and other exotics, although herbaceous cover in this system is often too low to attract cattle away from surrounding uplands. Off road travel can be a disturbance, especially in the early season, when clayey soils are still soft. In any season, heavy off road travel can be harmful to very slow growing dominant shrub species. In cases where the system has been impacted by heavy grazing, a rest-rotation regime with limited fall grazing may allow this system to recover by allowing regrowth of principal graminoid and shrub species. Severely impacted sites should be re-seeded to decrease soil erosion potential, to re-establish a native community, and to decrease weedy invasion by exotic species. Western wheatgrass can be used as the principal restoration species and can be seeded or transplanted as plugs. Once established this species spreads vigorously by rhizomes. Both greasewood and western wheatgrass exhibit excellent soil erosion control characteristics. Replanting with greasewood shrub seedlings may be necessary due to the slow recovery time within this system and low rates of natural seedling recruitment. Hansen, P. L., R. D. Pfister, K. Boggs, B. J. Cook, J. Joy, and D. K. Hinckley. 1995. Classification and management of Montana's riparian and wetland sites. Montana Forest and Conservation Experiment Station, School of Forestry, University of Montana, Miscellaneous Publication No. 54. 646 pp. + posters.